Bigger just got even better thanks to the new 82 cm TracVision M9, KVH’s powerful HDTV-ready satellite TV system that offers boaters outstanding entertainment and equips 80+ ft. recreational and commercial vessels with a sleek look that matches today’s streamlined vessels. Powered by KVH’s exclusive new RingFire antenna technology, integrated GPS, automatic, and fully stabilised skew adjustment, the TracVision M9 outperforms any similarly sized antenna on the market in rough seas and farther offshore! Plus, a unique mechanical design allows the 82 cm antenna to be housed in a dome that is 35% smaller than competing systems so it looks great, too. You can also rely on the TracVision M9 for even the most grueling commercial maritime applications. This powerful system is manufactured in compliance with the rigorous ISO 9001:2000 standard for quality and is subjected to the most stringent performance evaluations in the industry, making it the most rugged and reliable option for offshore commercial vessels. Whether your vessel is at the dock, at anchor, or cruising on the deep blue sea, TracVision M9 will bring you hundreds of channels of uninterrupted, crystal-clear digital entertainment with CD-quality sound. Enjoy High-Definition (HDTV) programming from any leading satellite and program provider with completely automatic satellite switching right from your remote control, just like home! When you’re out where the big boys play, the high-performance, HDTV-ready 60 cm TracVision M7 offers commercial-grade performance and rock-steady satellite TV reception perfect for boats 60-80 ft.! Add KVH’s GyroTrac Upgrade for outstanding performance in even the most extreme conditions. Plus, the new TracVision M7 includes KVH’s exclusive RingFire antenna technology for reception comparable to larger antennas and extending your coverage area as you head offshore. You can also rely on the TracVision M7 for even the most grueling commercial maritime applications. This powerful system is manufactured in compliance with the rigorous ISO 9001:2000 standard for quality and is subjected to the most stringent performance evaluations in the industry, making it the most rugged and reliable option for commercial vessels in need of extended range. With the TracVision M7, you’ll be watching the big game when the other boats are left with the message “SEARCHING FOR SATELLITE” on their TV screen! 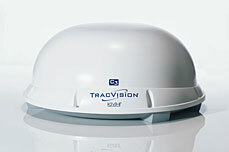 Includes an ultra-high efficiency 60 cm diameter antenna with proprietary RingFire technology for outstanding reception and signal gain when heading offshore in boats 60-80 ft.
You want the best for your boat, and with the high-performance, 45 cm diameter, HDTV-ready TracVision M5 satellite TV system, you’ve got it. Quality, reliability, durability – the TracVision M5 stays locked on and connects you to the premium satellite TV entertainment you want. Add KVH’s exclusive GyroTrac Upgrade for outstanding performance in even the most extreme conditions. 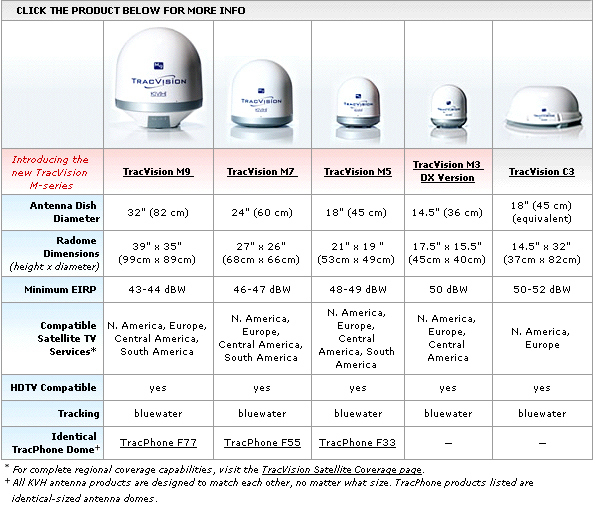 Plus, the new TracVision M5 includes KVH’s exclusive RingFire antenna technology, giving you 30% greater reception and more range than any other 45 cm system so you can enjoy satellite TV where no other 45 cm marine satellite TV antenna system has ever worked before! 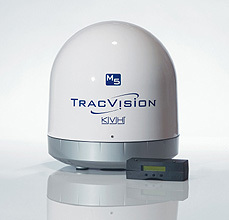 You can also rely on the TracVision M5 for even the most grueling commercial maritime applications. This powerful system is manufactured in compliance with the rigorous ISO 9001:2000 standard for quality and is subjected to the most stringent performance evaluations in the industry, making it the most rugged and reliable option for commercial vessels. Now a trip offshore doesn’t have to mean time away from your home theater! Check out KVH’s complementary TracPhone F33 Satellite Communications System, with the same size and styling plus powerful Inmarsat Fleet service, for the perfect match on your boat. Includes an ultra-high efficiency 45 cm diameter antenna with proprietary RingFire technology for outstanding reception and signal gain when heading offshore in boats 40-60 ft. Bigger isn’t always better. With the award-winning TracVision M3 DX, KVH’s new 36 cm antenna, boats as small as 25 feet are now able to access hundreds of crystal-clear TV channels throughout European waters. And with its simple design, including the compact antenna and a 12V multi-satellite junction box ready to connect to your boat’s power supply, TV, and selected home receivers, powerful technology has never been so easy to use. You can also rely on the TracVision M3 DX for even the most grueling commercial maritime applications. This powerful system is manufactured in compliance with the rigorous ISO 9001:2000 standard for quality and is subjected to the most stringent performance evaluations in the industry, making it the most rugged and reliable option for smaller commercial vessels. 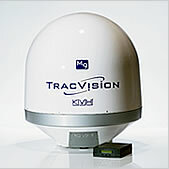 TracVision M3 DX – offering you an international satellite TV solution that is small, simple, and powerful. Fully automatic satellite acquisition and satellite switching via remote control just like at home! The economical and completely self-contained TracVision C3 is a low-profile marine satellite TV system with integrated DVB technology. Ideal for houseboats, hardtops, and convertibles, the system automatically identifies, acquires, and tracks satellite signals from a range of DIRECTV®, DISH Network, and DVB-compatible satellites. And since it requires no external control boxes or sensors, the TracVision C3 is easy to install. Whether your vessel is at the dock, at anchor, or on the move, TracVision C3 will bring you hundreds of channels of uninterrupted, crystal-clear digital entertainment with CD-quality sound. A powerful solution for broadband connections that leaves all other satellite services in its wake! Now you can rely on broadband at sea the way it was meant to be thanks to the revolutionary TracPhone V7 with mini-VSAT Broadband service, the newest, most affordable option in marine communications. It’s the ideal way for you, your passengers, and your crew to stay connected with the same high-quality broadband data connections you use onshore. Enjoy high-quality, consistent, always-on broadband data connections, multiple Voice over IP (VoIP) telephone lines, and reasonable service costs thanks to mini-VSAT Broadband’s modern spread spectrum satellite technology. 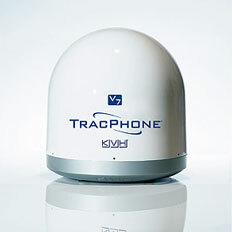 This powerful new service is available via the rugged 24" (60 cm) KVH TracPhone V7 antenna. A fraction of the size of standard 1-meter VSAT systems, the TracPhone V7 and its fully integrated below-decks modem and control unit offer easy connections to shipboard networks, fully stabilized tracking, a remarkable reduction in the cost of hardware and installation, and all with no compromise in performance! In fact, mini-VSAT Broadband creates a “cable modem” experience at sea while offering great coverage, outstanding network traffic management, and consistent performance. The result? You get exactly what you expect with regard to service speeds, reliability, and unlimited access, all for much less than what you’re used to paying. Choice of always-on, fixed price or per-megabyte subscription plans and easy, 1-call activation; plus KVH as your single point of contact for sales, installation, activation, and support! In today’s world, up-to-the-minute information is critical to vessel safety, operation, and business. Fleet managers, ship captains, and yacht owners require reliable communications as well as cost-effective data applications including real-time access to e-mail, Internet services, corporate intranets, and Virtual Private Networks (VPNs). The KVH TracPhone F77 marine satellite communications system now makes this possible, enabling a truly mobile “office at sea”. With pole-to-pole global coverage, TracPhone F77 delivers fast Internet/Intranet connections, video conferencing, and voice/fax service. TracPhone F77 provides access to both Fleet’s Integrated Services Digital Network (ISDN) channel and Mobile Packet Data Service (MPDS) via Inmarsat’s globalbeams. Enjoy two powerful options for high-speed Internet access: ISDN (per-minute charge) for high-bandwidth voice, video conferencing, and large file transmission; and MPDS (per-megabit charge) for a high-capacity, always-online connection. Now up-to-date weather reports or maritime chart and navigational updates are available virtually anywhere you travel. TracPhone F77 is fully compatible with shipboard PABX systems as well as onboard networks (when connected to an IP router). In addition the Inmarsat Fleet F77 service is designed to meet the International Maritime Organization’s (IMO) latest distress and safety specifications of the Global Maritime Distress and Safety System (GMDSS). 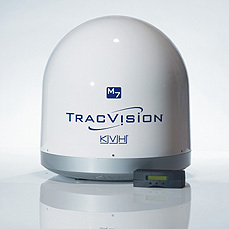 Fleet F77 and TracPhone F77 are also both compatible with Inmarsat’s 4th generation of satellites ensuring that your investment in communications today will continue to pay dividends in the future.Check out KVH’s complementary TracVision M9 Satellite Television System, with the same size and styling, for the perfect match on your boat. Pole-to-Pole Global Integrated Services Digital Network (ISDN) service for video conferencing and large data transfers at speeds as high as 320 Kbps (up & down)*; new higher speeds coming in 2005! * With KVH Velocity Acceleration software and Inmarsat Airtime from KVH. Velocity Acceleration software boosts data rates by 200-500%. Rates using Velocity Acceleration may vary based on content being transferred.